The second day of the 2017 NCAA tournament concluded the first round and didn’t include any major upsets. Kansas and North Carolina eased through, as expected from number one teams, as did Duke and Kentucky in their games. Wichita State, Rhode Island and USC were the three lower seed teams that advanced in their games, although it wasn’t too big of a surprise. #16 UC Davis 62 #1 Kansas 100: Easy game for Kansas, who advance towards a clash with Michigan State. Frank Mason led the Jayhawks with 22 points, while the rest of the starting five also finished in double figures. Kansas shot 56.3% from the field and 44% from beyond the arc. #15 Northern Kentucky 70 #2 Kentucky 79: The Wildcats finished the first half strong and never needed to worry about their cross state rivals causing them any problems. De’Aaron Fox and Isaiah Briscoe led Kentucky with 19 and 17 points respectively. They face Wichita State next. 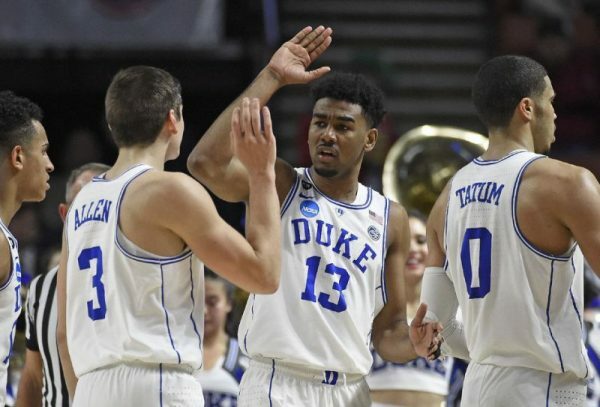 #15 Troy 65 #2 Duke 87: An early 3-point barrage from Duke (13 threes overall, 46.4%) ended any chance of this game being competitive. Grayson Allen led them with 21 points off the bench, Jayson Tatum helped out with 18 points. Duke face South Carolina next. #14 Kent State 80 #3 UCLA 97: The Bruins firepower was too much for Kent State, as UCLA shot 62.7% from the field. T.J. Leaf finished with 23 points and Lonzo Ball helped out with 15. UCLA play Cincinnati next. #11 Kansas State 61 #6 Cincinnati 75: No first four Cinderella comes from Manhattan, as the Bearcats jumped to the lead early and never saw any threat from KSU. Senior Troy Caupain led Cincinnati with 23 points. They play UCLA next. #10 Wichita State 64 #7 Dayton 58: Being the lower seed didn’t really stop the Shockers from moving on, pulling away in the final six minutes, landing them a game with Kentucky. Landry Shamet led Wichita State with 13 points. #9 Michigan State 78 #8 Miami 58: Not exactly surprising, but no one expected it to be a blowout. A big 15-4 run by MSU in the final 5 minutes of the first half blew the game wide open, and the ‘Canes never bounced back from it. Nick Ward scored 19 points for Michigan State, who’ll play Kansas next. #10 Marquette 73 #7 South Carolina 93: The size and speed of the Gamecocks was too much for Marquette, who didn’t expect to get blown out like that. Sindarius Thornwell scored 29 points to lead South Carolina, now facing Duke in the round of 32. P.J. Dozier helped out with 21 points. #16 Texas Southern 64 #1 North Carolina 103: The biggest blowout of the first round, as UNC allowed themselves to rest their best players in the second half, no one playing more than 24 minutes. Justin Jackson led North Carolina with 21 points, now off to face Arkansas. #14 Iona 77 #3 Oregon 93: An easy win for the Ducks, hoping for another deep run in the tournament. Tyler Dorsey scored 24 points while shooting almost 70% from the field in the win. They’re off to face Rhode Island next. #15 Jacksonville State 63 #2 Louisville 78: Things go mostly smoothly for Louisville in their tournament opener, led by 18 points from Mangok Mathiang, who averaged only 7.7 points per game during the season. Now it’ll be a big game against Michigan. #11 USC 66 #6 SMU 65: A late 3-pointer by Elijah Stewart gave the Trojans the upset victory over the overconfident SMU, which broke a lot of brackets. Stewart hit six 3-pointers in the game to finish with a team-high 22 points. USC will play Baylor next. #14 New Mexico State 73 #3 Baylor 91: Baylor scored 53 second-half points against an Aggies team many thought had the quality and momentum to pull off the upset. Al Freeman led Baylor with 21 points off the bench. Baylor will play USC next. #10 Oklahoma State 91 #7 Michigan 92: Michigan hit 16 shots from beyond the arc (55.2%) which was enough for them to get by a more athletic team. The Cowboys couldn’t force the turnovers they’re used to live off (only 4 for Michigan), and didn’t have the firepower to overtake the Wolverines. 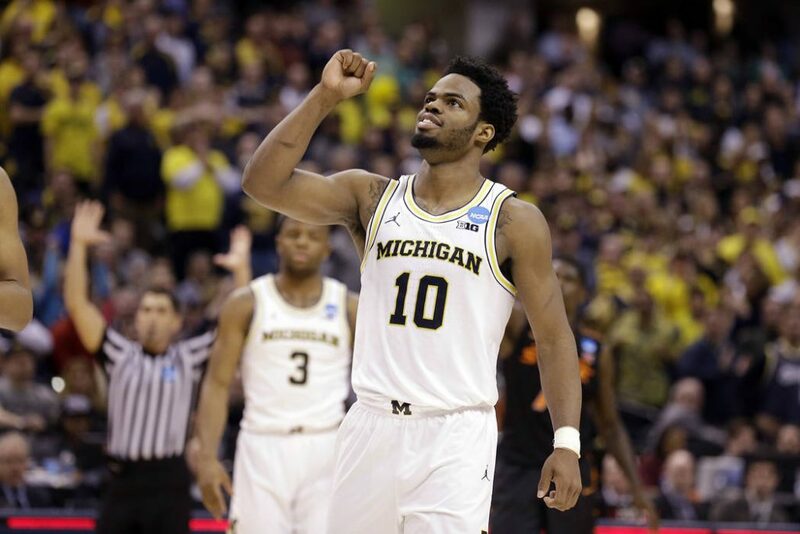 Derrick Walton Jr. led Michigan with 26 points. They’ll face Louisville next. #9 Seton Hall 71 #8 Arkansas 77: A late flagrant foul by Seton Hall and a go-ahead layup by Jaylen Barford put the Razorbacks in the round of 32, with 23 points from Moses Kingsley leading the way. They’ll play North Carolina next. #11 Rhode Island 84 #6 Creighton 72: The bad seeding by the committee put a much stronger URI as “on paper” underdogs against the Bluejays. It didn’t look like that during the game. Freshman Jeff Dowtin, averaging just 5.5 points per game during the season, stood out with 23 points, including 10-for-10 from the line. Rhode Island will play Oregon next.